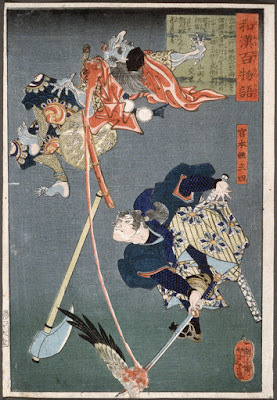 also known as Shinmen Takezō, Miyamoto Bennosuke, or by his Buddhist name Niten Dōraku, was a Japanese swordsman and samurai famed for his duels and distinctive style. the author of The Book of Five Rings (五輪書, Go Rin No Sho), a book on strategy, tactics, and philosophy that is still studied today. He grew up in Miyamoto village, in the Yoshino district of Mimasaka Province, now Okayama prefecture. In Kyoto he fought many duels against the Yoshioka school. 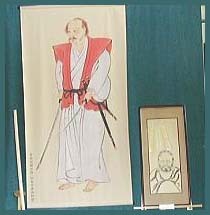 From 1605 to 1612, he travelled extensively all over Japan in Musha Shugyo　武者修行, a warrior pilgrimage during which he honed his skills with duels. In 1611, Musashi began practicing zazen at the Myoshinji Temple 妙心寺. On April 13, 1612, Musashi fought his most famous duel with Sasaki Kojiro 佐々木小次郎, on the island of Funajima, in the Kamon Straight. In 1622, Musashi's adoptive son, Miyamoto Mikinosuke, became a vassal to the Himeji Domain. In Yamagata he adopted a second son, Miyamoto Iori. In 1633, Musashi began staying with Hosokawa Tadatoshi, daimyo of Kumamoto Castle. 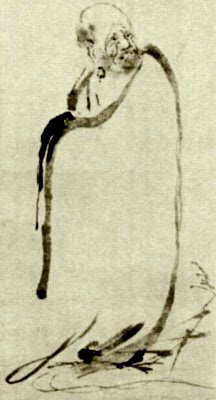 In 1643 he retired to a cave named Reigando 霊巌洞 as a hermit and died there. 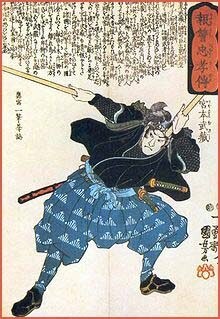 Musashi created and perfected a two-sword kenjutsu technique called niten'ichi (二天一, "two heavens as one") or nitōichi (二刀一, "two swords as one") or "Ni-Ten Ichi Ryu" . and "Wild Geese Among Reeds" (Rozanzu, 魯山図). The most famous hero fighting with two swords is maybe Miyamoto Musashi, who was subject of a yearlong TV series on NHK in 2003. Musashi also painted Daruma san, see below. Musashi actually painted a 鵙, mozu, a (bull-headed) shrike; a butcher-bird.
. Musashi and the Tenku of Fukuoka . Musashi is really a good guide to Japanese Culture. He was born in the old Sakushu province, close to my home now in Okayama prefecture ! And his lady-friend was called O-Tsu　お津, like my cat. Or should I say, my cat was called after her ! Last year NHK state television had a yearlong once a week program about Musashi and his times, and since my cat was born that year she got that name. As you know, her son is HAIKU Kun. Fudo like a swordsman (kenkaku 剣客) holding the sword in both hands. Jōdō　杖道　Jodo literally means the way of the stick. above the castle town of Fukuoka Musashi spent 37 days meditating and training – and received a revelation from the Tengu (long-nosed winged demons, famous as the source of several martial traditions) to take the round pole and place it on the water of the moon (Water Moon, or Suigetsu, is the Japanese word used in budo to indicate the solar plexus on the human body). Nobusuma 野衾 (のぶすま）"wild quilt", "wild blanket"
Sometimes depicted as a flying squirrel, sometimes as a huge bat.